Local governments find themselves dependent on co-operation, not only with other levels of government but also with a range of non-governmental actors. New actors, drawn from the private sector, civil society, and technocratic élites, have become involved in the governing process and interdependencies have grown. Various approaches have been implemented to link the third sector and government, and various conceptualizations and analyses have emerged. This chapter explores strategies to involve the third sector in local government in Ireland. Ireland makes for an interesting case since it depicts an example of a state-designed system for formally integrating the third sector in the reformed structures of local governance. 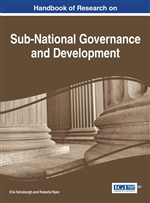 It provides insights about the theory and practice of subnational governance and generates transferable knowledge about the impact of nationally directed strategies to integrate the third sector with government. It also offers suggestions for further research on such linkages. In both their social problem-solving and service-delivery roles, local governments find themselves dependent on co-operation, not only with other levels of government but also with a range of non-governmental actors. New actors, drawn from the private sector, civil society, and technocratic élites, have become involved in the governing process and interdependencies have grown, resulting in formal and informal alliances involving actors from the public, private and voluntary or third sectors. A wealth of literature portrays the strategies devised and the payoffs and problems inherent in the collaborative approach to governance (Geddes, 2006; Healey, 2015). The roles played by the third sector have varied as they became involved in networks, multi-sectorial/inter-agency collaborations, and partnerships. Such entities are complex and dynamic, reflecting changing issues and relationships and the distribution of power and resources. In recent years the state-third sector relationship in many countries has become increasingly formal, with different levels and forms of regulation being introduced (Phillips & Rathgeb Smith, 2014). While roles and relationships vary from country to country, there is evidence of an increased role for the local level in promoting and achieving development in this changing landscape. Changing paradigms and social expectations, as well as financial stringency, mean that local governments must increasingly rely on co-operation from third sector organizations to make development happen. This chapter explores strategies to formally involve the third sector in local government in Ireland. Ireland makes for an interesting case since it depicts a nationally designed system for formally integrating the third sector in the reformed structures of local governance while also encapsulating the intense effects of austerity on all sectors. The chapter begins by investigating perspectives on the role and relationships of the third sector in contemporary public governance. Drawing on international literature, it reviews both conceptual interpretations and practical manifestations. The focus then moves to Ireland, with a brief overview of the evolution of local government and the third sector, followed by a discussion of current form and functioning and the impact of recent reforms. Limerick City and County Council provides an exemplar of the formal integration of the third sector in a local authority, using qualitative data to identify and analyze the changes brought about by the top-down reforms. The chapter concludes by reviewing the relevance of the changed structures and relationships for the public and third sectors, setting the Irish case in the international context and making some recommendations for future research. The Third Sector: organized intermediaries who operate upwards, downwards, and outwards between the government and citizens of Ireland. LCDCs: Local Community Development Committees, created in 2014 to serve as a conduit for third-sector input to local government planning and service delivery. Limerick: Ireland’s third city, in the south west of the country. Its city and county councils were merged in 2014. PPNs: Public Participation Networks, structures to engage citizens and organizations with a view to formally participating in local governance. Ireland: a country in Western Europe with a long tradition of community involvement in service delivery and advocacy. Community and Voluntary Sector: the umbrella term for the third sector in Ireland combining the voluntary sector’s service-orientation and the community sector’s local development, empowerment, and social inclusion focus.